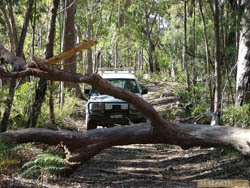 An exceptional 4x4 experience in the Deua National Park in the hinterland behind the NSW South Coast town of Moruya. This trek of 145 km can be done in one long day but unless you are a local (like me!) I suggest you spread it over 2 or 3 days. The first day could be spent travelling to Moruya which has all facilities. After stocking up on the essentials head NW along Araluen Road for 33 km to Dry Creek Campground turnoff on the left. This beautiful campsite on the Duea River would be a great spot for the first night. Immediately the next morning is the Duea River crossing where care should be taken especially at higher river flows. Follow the Dry Creek Fire Trail west for 7 km where it joins The Merricumbene Fire Trail. A further 31 km is Bendethera Trig which is a short detour to your right and at an elevation of around 1000 meters. This is the third time since leaving the Duea River (elevation 10 meters) that this trail has ascended to 1000 meters so the 4x4ing is classic with several steeply eroded ascents (and corresponding descents) with tight corners to negotiate. Suitably prepared and capable vehicles with similar drivers are essential. Turn right after exiting Bendethera Trig onto The Bendethera Fire Trail. (The other road at this intersection leads to Little Sugarloaf Road which is the way out after visiting Benethera itself.) After 7 km of yellow clayey road which is treacherous in the wet you reach the Dampier Mtn Fire Trail which is avoided by turning right and then once again you cross The Duea River. There are numerous fantastic camping sites spread along the river for the next 4 km so take your pick for the second night. On the left is the turn off to Bendethra Caves (take your torch) which is a 4 km 1.5 hour walk. Further straight on are some great sites where I have camped during the height of the drought (and the Duea still flowed well). There is lots written on Bendethera (try Google or any 4wdrive trip book) praising this beautiful valley and its wildlife. All of it is true and this is what makes Bendethera one of the premier 4x4 destination in Australia. Next morning this trek unfortunatley backtracks to Bendethera Trig . The right turn is taken which leads to Little Sugarloaf Road, then right onto Western Boundary Road, then left onto the bitumen of The Princes Hway. A few kms up the road is the turn off to Tuross Head (where I live!) which is then end of this trek.